WARREN GATLAND SAYS there is “no doubt” Wales’ players have been affected by a proposed merger between the Scarlets and the Ospreys ahead of their Six Nations clash with Scotland on Saturday. The newly-formed Professional Rugby Board (PRB) are to discuss plans for a radical change to regional rugby in Wales, which could see the introduction of a club in the north of the country and one less team in the south. 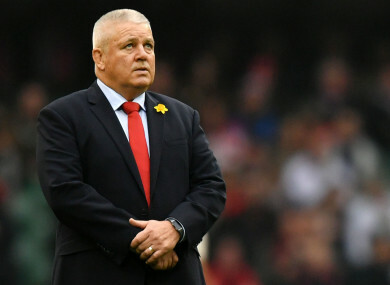 Welsh Rugby Union (WRU) chief executive Martyn Phillips addressed Gatland’s Grand Slam hopefuls on Monday to discuss the issue, which Wales’ head coach stressed has been driven by the regions rather than the governing body. Gatland has urged his squad not to lose focus as they eye a Grand Slam but says the uncertainty has understandably had an effect on the group. “There’s no doubt the players have been distracted. It is concerning. Players have been going home and asked question by wives and partners what’s going on,” said the New Zealander. “Our message to the players is we need to wait and see what the outcome of the PRB meeting is going to be, the conclusion between the four regions and the union collectively. It’s a joint decision. You try and put players’ minds to rest and focus on winning the Six Nations. “It’s been a challenge for the players. That’s why we had Martyn Phillips here yesterday addressing the squad. Gatland added: “The timing isn’t brilliant but the players have been professional. If a team does end up in north Wales, it’s going to be challenging for players who may go up there but from a Welsh perspective I see it as a massive opportunity. “There’s a million people and big businesses up there. Our crowds aren’t big enough. A team in north Wales may be a positive outcome for Welsh rugby long-term. I want to reiterate it has not been driven by the WRU but by the regions. There’s been a lot of criticism of the WRU in the last 48 hours but a lot of it is misinformation. Email “'No doubt' Welsh players distracted by merger talk, says Gatland”. Feedback on “'No doubt' Welsh players distracted by merger talk, says Gatland”.